What if you woke up one morning and read in the paper that an oil well off Mount Desert Island had ruptured? On Jan. 4, the Trump administration announced its intention to open 90 percent of America’s coasts to leases for offshore drilling, exposing Maine to this nightmare scenario with the prospect of seismic testing and oil and gas operations just a few miles from the beach. 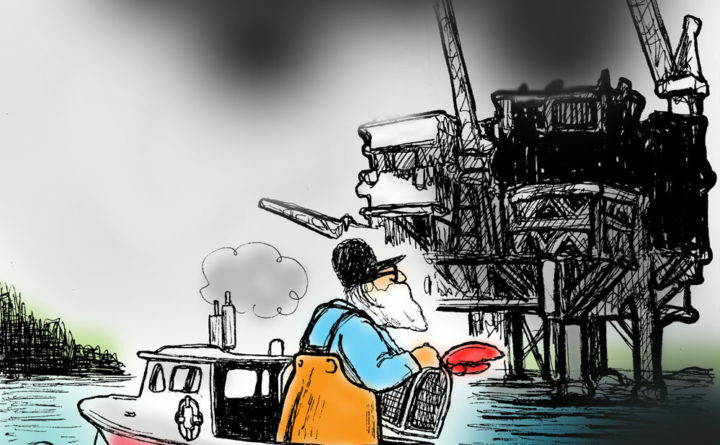 Oil may be off our shores, but to go after it threatens the way we live. Drilling predictably leads to oil spills, which can be disastrous. In 2010, as a result of the BP Deepwater Horizon offshore debacle in the Gulf of Mexico, 11 people lost their lives, thousands of marine mammals and birds are estimated to have perished, and the gulf states lost $23 billion in tourism-related dollars. Why would Maine risk such a disaster? For generations, Maine residents have relied on healthy coastal waters. A healthy, vibrant coastline guarantees us a living, draws tourists and supports thriving communities. A 2015 report by Oceana, which looked at National Oceanic and Atmospheric Administration data, found that the coastline generated $2.5 billion in economic activity for Maine. Whether you’re a fisherman, a hotel owner, or a chef at a restaurant, you rely on a clean coast. You may even own or work for an ocean-dependent local business. Dulse & Rugosa is a small island-based business that makes seaweed-rich shampoo bars for those of us who want a natural solution for a chronically itchy scalp and are concerned about plastic bottles pollution our oceans. Maine currently is No. 1 in the country for seaweed production. It is a growing business with both wild harvesting and aquaculture. Maine seaweed is prized because of our cold, clean, mineral-rich waters. The Trump administration’s draft proposal to open more than 90 percent of the Outer Continental Shelf to oil and gas exploration is scary. Plastic pollution is a problem humans could solve after the fact — with enormous effort — but oil spills have consequences we can not imagine. One single oil spill could decimate Maine’s tourist industry, fishing industry and the growing seaweed industry. Even if the spill is able to be “cleaned,” our reputation for quality ocean products may not recover. Unlike many issues these days in Washington, D.C., opposition to this disastrous new drilling plan crosses party lines. Just a few years ago, former President Barack Obama proposed opening up parts of the Atlantic, the Gulf and Alaska to expanded seismic testing and offshore drilling. Coastal business leaders, commercial fishing families and leaders from both parties convinced the administration that the oil was not worth the risk. We agree. We can’t risk the threat of an oil disaster in our community. We hope our fellow Mainers will join us in voicing opposition to this shortsighted and dangerous proposal. Our gorgeous coastline and our way of life depend on it. Jacqueline Guyol is a campaign organizer with Environment Maine. Claire Weinberg is the owner of Dulse & Rugosa, a local business in Gotts Island near Bass Harbor.